One way through which Ummah Welfare Trust’s 100% donations policy has been maintained, after the help of Allah, is through a nationwide clothes recycling scheme. Old clothes can be donated at Ummah Welfare Trust’s clothing banks which are then recycled or sold at charity shops to generate a revenue. Ummah Welfare Trust has over 160 clothing banks across the UK, ensuring that thousands of tonnes of old clothes are recycled and don’t end up as waste. Selling second-hand goods prevent them from going to landfill and ease the pressure on using new resources to create and purchase more goods. Alhamdulillah, the proceeds help cover the charity’s administration costs. Would you like to help Ummah Welfare Trust maintain its 100% donations policy? Do you have space in your local Mosque, Madrassah or business car park? 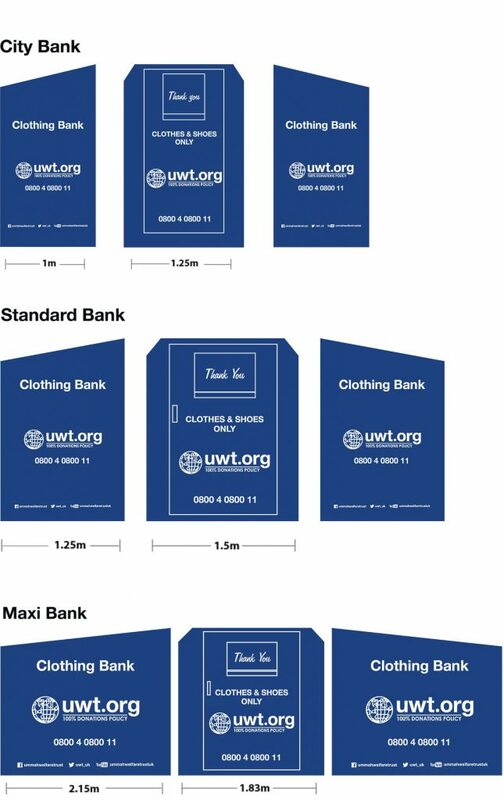 Would you like a clothing bank like one of the above? If you’re interested in a clothing bank, please call us and gain the rewards for the humanitarian work carried out by Ummah Welfare Trust. Call 01204 661 030 between 9am and 6pm or email info@uwt.org. Find your nearest clothing bank! Please do not overfill your bags so that they easily fit into the shoots and do not tear. Washed, pressed and properly bagged clothing are ideal, keeping costs down and helping Ummah Welfare Trust recycle them in the best manner.